↑ The Christian Science Monitor. "Boko Haram escalates battle with bold move into Chad (+video)". The Christian Science Monitor. สืบค้นเมื่อ 2016-02-20. 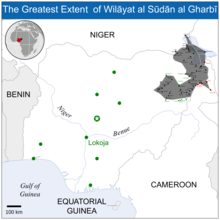 ↑ 4.0 4.1 West Africa leaders vow to wage 'total war' on Boko Haram By John Irish and Elizabeth Pineau. 17 May 2014 2:19 PM. ↑ "Vigilantes Settle Local Scores With Boko Haram". Voice of America. 15 February 2015. สืบค้นเมื่อ 15 February 2015. ↑ Adama Nossiter (12 March 2015). "Mercenaries Join Nigeria's Military Campaign Against Boko Haram". The New York Times. สืบค้นเมื่อ 16 March 2015. ↑ Union agrees to send 7,500 troops to fight Boko Haram in Nigeria[ลิงก์เสีย]. Mashable.com, Jan 31, 2015. ↑ 8.0 8.1 The African Union Readies an Army to Fight Boko Haram, Medium.com. ↑ 9.0 9.1 9.2 "Feeling the heat: West combats extremists' advance in Africa's deserts". CNN. 27 February 2015. ↑ 11.0 11.1 11.2 Kidnapped schoolgirls: British experts to fly to Nigeria 'as soon as possible'. theguardian.com, Wednesday 7 May 2014 17.33 BST. ↑ 17.0 17.1 "Obama to deploy 300 US troops to Cameroon to fight Boko Haram | World news". The Guardian. สืบค้นเมื่อ 25 October 2015. ↑ 18.0 18.1 "US troops deployed to Cameroon for Boko Haram fight". Al Jazeera English. 2015-10-14. สืบค้นเมื่อ 25 October 2015. ↑ Sudarsan Raghavan (31 May 2013). "Nigerian Islamist militants return from Mali with weapons, skills". The Washington Post. สืบค้นเมื่อ 29 December 2014. ↑ Steve White (13 March 2013). "Nigerian hostage deaths: British hostage executed in error". Daily Mirror. สืบค้นเมื่อ 29 December 2014. ↑ "How Big Is Boko Haram?". 2 February 2015. สืบค้นเมื่อ 2 February 2015. ↑ "Boko Haram 'fighters' surrender as alleged chief killed". BBC. September 25, 2014. สืบค้นเมื่อ June 20, 2016. ↑ "Nigerian military claims surrender of 200 Boko Haram fighters". Yahoo. September 25, 2015. สืบค้นเมื่อ June 20, 2016. ↑ "76 starving Boko Haram members surrender to Nigerian military". Fox News. March 2, 2016. สืบค้นเมื่อ June 20, 2016. ↑ "300 Boko Haram members surrender in Cameroon". Vanguard. September 28, 2014. สืบค้นเมื่อ June 20, 2016. ↑ "800 Boko Haram militants surrender to Nigeria, General claims". The Independent. April 7, 2016. สืบค้นเมื่อ June 20, 2016. ↑ "Nigerian troops 'rescue 157 captives as 77 Boko Haram members surrender'". Premium Times. June 1, 2016. สืบค้นเมื่อ June 20, 2016. ↑ 32.0 32.1 John Campbell. "Nigeria Security Tracker". Council on Foreign Relations. สืบค้นเมื่อ 9 January 2014. ↑ "ACLED Version 6 (1997–2015)". Armed Conflict Location & Event Data Project. สืบค้นเมื่อ 13 January 2015. ↑ 34.0 34.1 "The Boko Haram insurgency, by the numbers". The Washington Post. 6 October 2014. "Since July 2009, when the Boko Haram conflict escalated, at least 11,100 people have died on all sides of the insurgency." ↑ "ACLED Version 5 (1997–2014)". Armed Conflict Location & Event Data Project. สืบค้นเมื่อ 13 January 2015. ↑ "Who are Nigeria's Boko Haram Islamists?". BBC News. สืบค้นเมื่อ 2016-02-20. ↑ Adama Nossiter (27 July 2009). "Scores Die as Fighters Battle Nigerian Police". The New York Times. สืบค้นเมื่อ 29 December 2014.